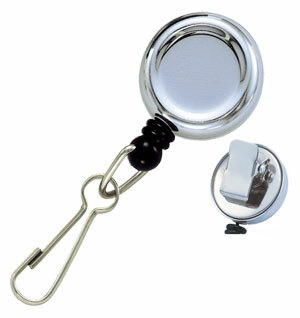 Our heavy-duty retractable badge reels are used in numerous work and industrial environments. Our heavy-duty badge reels are manufactured from heavier materials for industrial applications. These heavy-duty badge reels offer a stronger cord and stronger spring making this the badge reel for those users that have a lot of keys or where the reel is being used constantly. A tightly gripping belt clip keeps the badge reel securely attached and id card available instantly. A reinforced vinyl strap secures the card to a retractable extra strong 24" cord.